The devices within the Max for Live Essentials Pack are incredibly powerful. A lot of these devices offer new approaches to audio processing, device control and melodic and rhythmic generation not available in any other plugin devices. This course focuses on device control. As such the devices covered; Mono Sequencer; Note Echo; Device Randomizer; Map8; MultiMap; XY Pad; Envelope and Expression Control allow you to generate, modify, control and effect MIDI and Audio data within Ableton Live. No matter what genre of music you are producing, this course and these devices are essential! Mono Sequencer is an analog-inspired step sequencer with independent phases for parameters such as pitch, octave, velocity, repeat, and gate. There are many sequencers out there but this is by far one of the most powerful, creative and intuitive. Note Echo is a MIDI echo effect. Similar to an audio echo effect but it processes MIDI note information with all the controls you are used to from your delay effects. We explore some basic examples before moving onto some complex setups using multiple instances in series and in parallel, placing the devices in Effect Racks to produce dynamic and interactive results. Device Randomizer allows to randomise the parameters of any other device in your Session. Whether applying to create new presets, organic modulation, or using in generative compositions this tool can aid is suggesting sound design possibilities you wouldn’t have thought of, and it can keep doing it over and over again! Continuing on from the previous video we go deeper into the application of this powerful device. Device Randomizer allows to randomise the parameters of any other device in your Session. 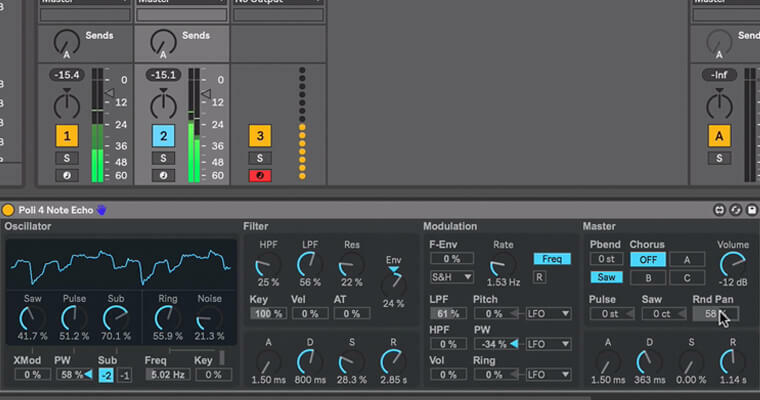 Whether applying to create new presets, organic modulation, or using in generative compositions this tool can aid is suggesting sound design possibilities you wouldn’t have thought of, and it can keep doing it over and over again! These are essential tools for controlling your studio session and stage performances. Map8 is a utility Macro device especially useful with Push and other 8 knob controllers. Learn how to control parameters on other tracks (or the same track) without switching track focus on Push, or any 8 channel MIDI controller. MultiMap is a control Device that allows you to map up to eight parameters anywhere in your Live set and control their values simultaneously, just like having four hands! XY Pad is a control Device that allows you to map up to two parameters anywhere in your Live set, and control them at the same time by moving the blue circle in a two dimensional space. Anyone familiar with Korg’s Kaoss Pads will know the power this setup can unleash. Envelope uses an envelope function generator to modulate a single parameter in your Live Set. 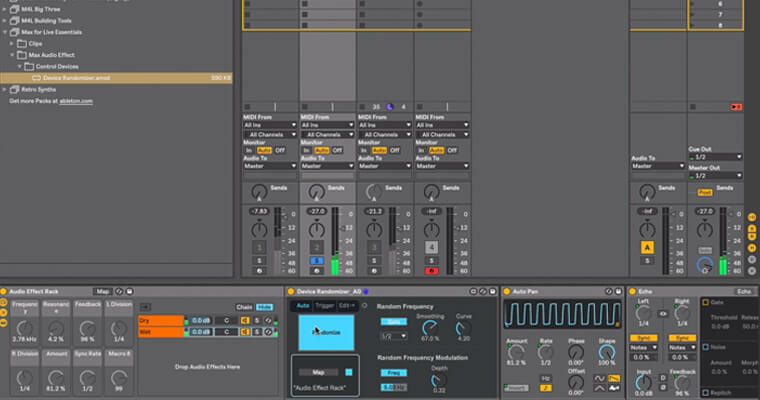 Now you can apply the power and control of an ADSR envelope to any parameter within Live. Expression Control is a control device that allows you to pair a MIDI parameter (Velocity, Modwheel, Pitchbend, Aftertouch, and Keytrack) with any parameter in your Live set; then the values of the selected MIDI category are used to control the mapped parameter. This functionality is usually included in high end synthesisers and sound design tools, now you have the same control and can apply it as many times as you want to as many devices as you want for organic interactive control. We covered a lot in this course, the video is just a summary of what we discussed and some thoughts on where to go next. 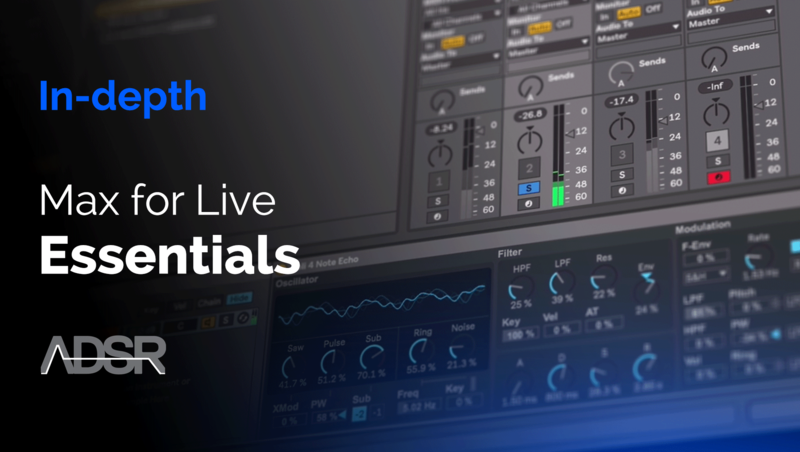 In this course we will be exploring the Max for Live Essentials pack that comes with Ableton Suite. Our main focus is the control devices; devices that generate, modify, control and effect MIDI and Audio data within Ableton Live. We will start of by looking at the basic functionality of these devices and then I will go deeper and look at some more advanced uses.